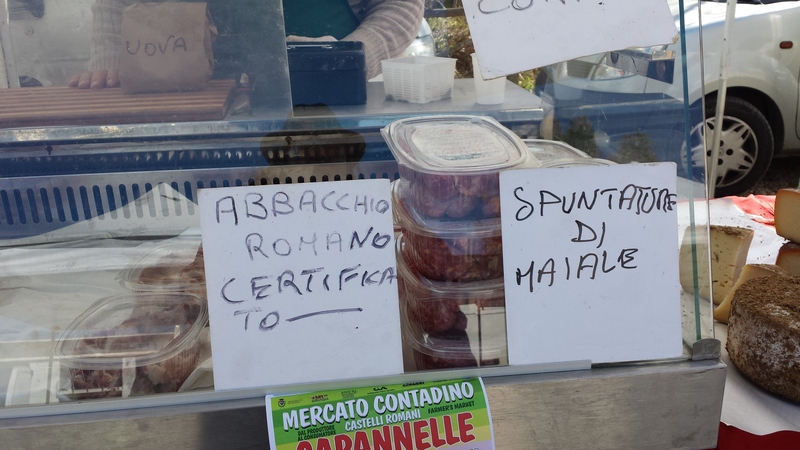 I bought some mutton at the Mercato Contadino of Ariccia some time ago on a Sunday morning. The Azienda Agricola Fratelli Frasca farm is not far from Anzio and is called ‘Il Vecchio Ovile’, which translates as ‘The Old Sheep Farm’. 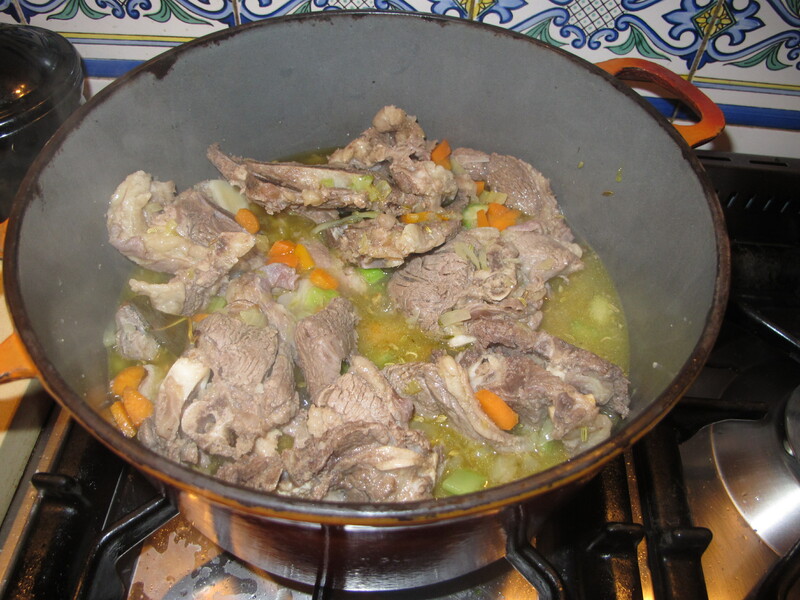 Mr Frasca gave me ample instruction on how to make a great pasta sauce with the mutton and I will one day make one as per his instructions but I ended up making a stew instead. 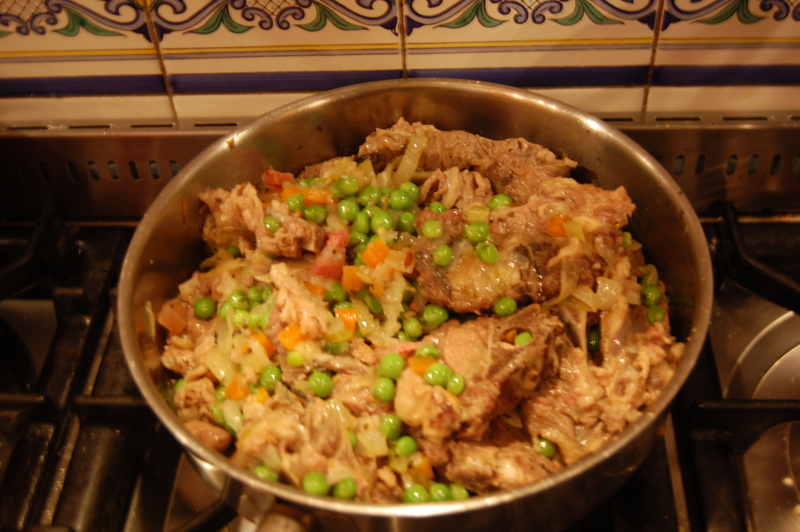 You never know with mutton or ‘castrato’ as it is called in Italy … it can be a tough, chewy meat, however rich in flavour. 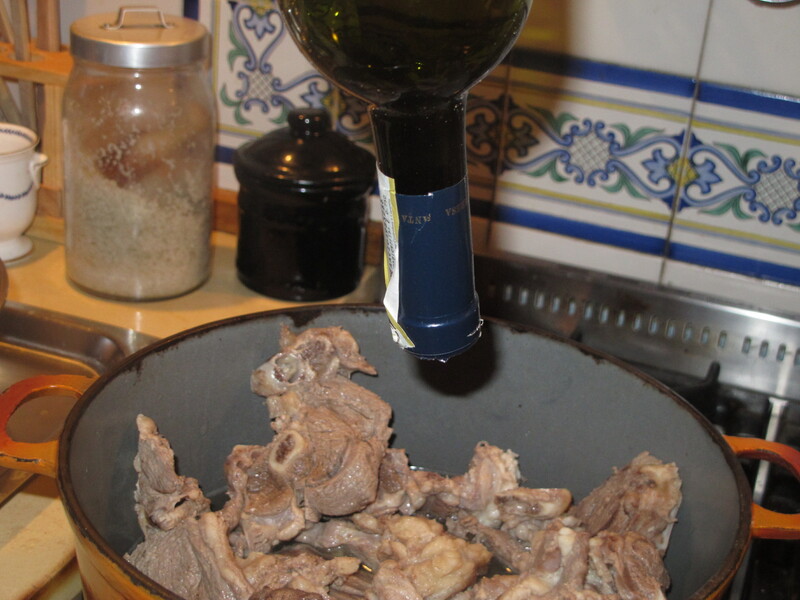 It is traditional in Italy to soak cuts of castrato in a marinade of wine or vinegar plus herbs, because it is supposed to be quite a ‘strong’ tasting meat and in need of taming. Mr Frasca assured me that his castrato needed no such tenderising and that its delicious taste was quite capable of speaking for itself. ( http://www.youtube.com/watch?v=WO23WBji_Z0?). Not everyone might share my love of old musicals but this duet is guaranteed to bring a smile to anyone’s lips. 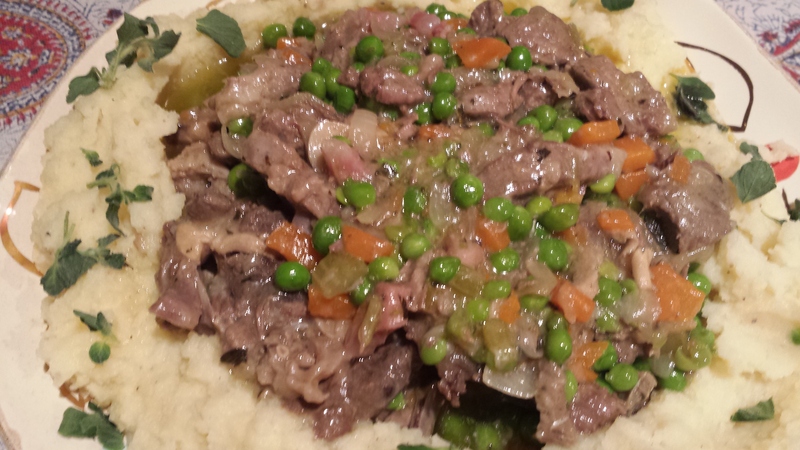 It is a Spring dish on account of the fresh peas. For those who follow a Lenten non-meat diet, this will be a lip-smacking treat to look forward to on Easter and after Easter. It is not a difficult recipe but does require good ingredients and, say I, Frascati white DOCG wine. 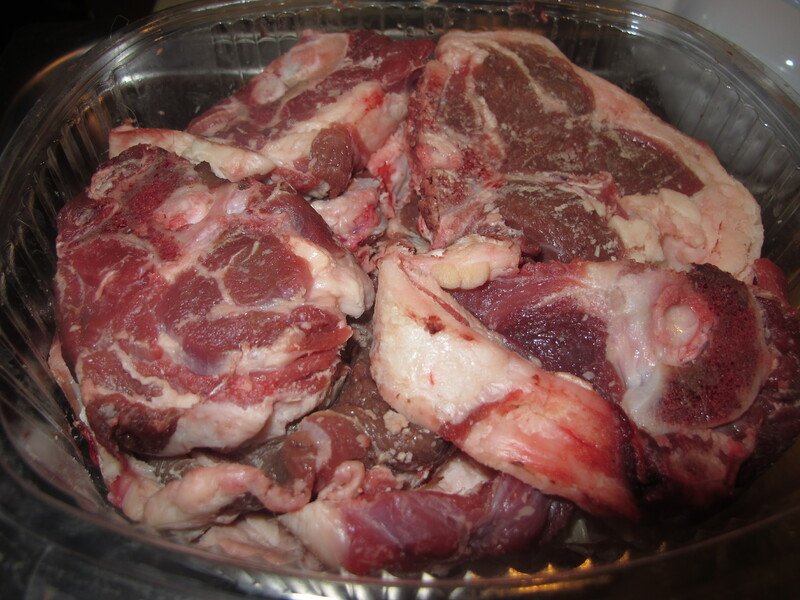 Here are the castrato chunks … I decided to trust Mr Frasca and eschewed the idea of a marinade. 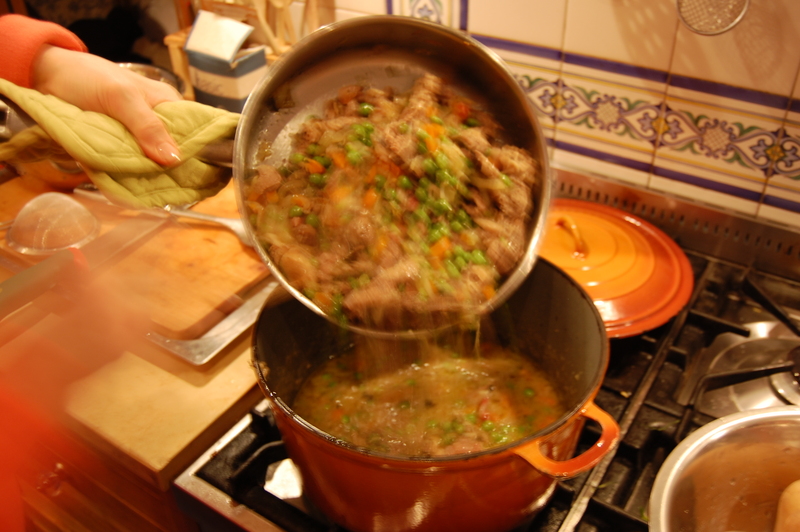 I did, however, think it would be wise to briefly boil the meat in boiling water for a few minutes, as one does when making Blanquette de Veau, to remove any ‘scummy’ elements. 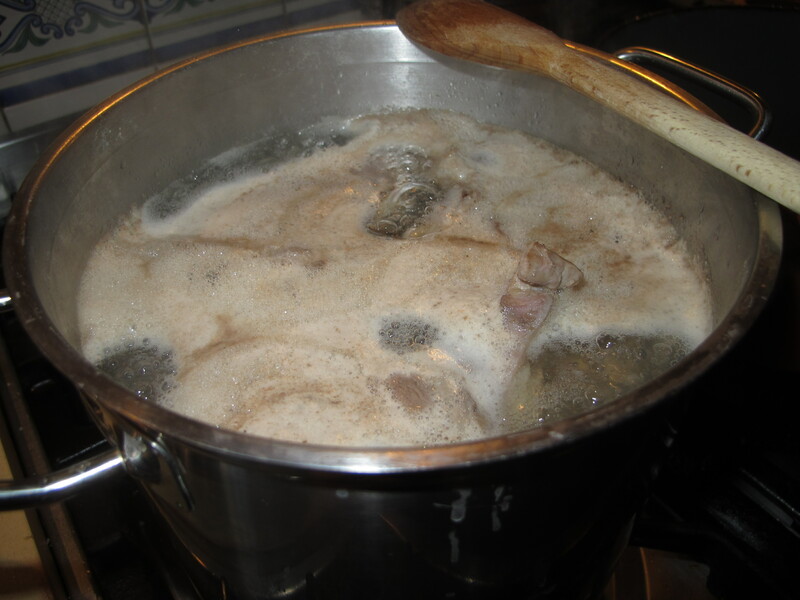 It is easily done … Bring a pot of water to a strong boil … Plunge the meat inside and very shortly … this is the ‘froth’ that will rise to the surface. Remove the froth by and by, with a slotted spoon. 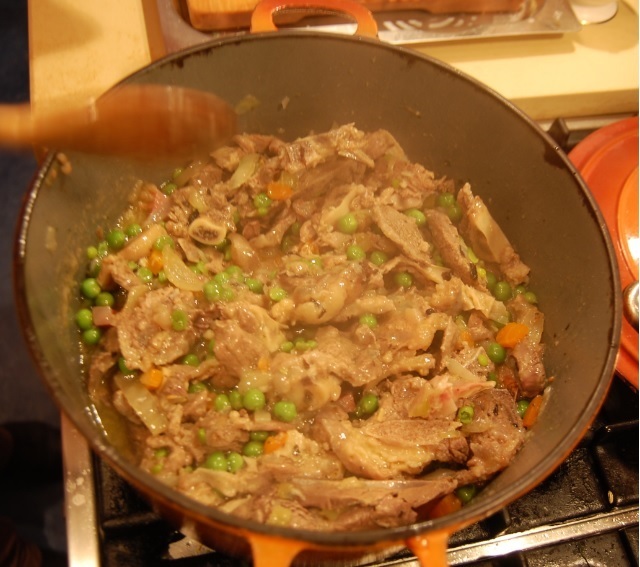 After about 4-5 minutes, drain the meat and place it in a good casserole … an earthenware one or a heavy bottomed pan, that comes with a lid. 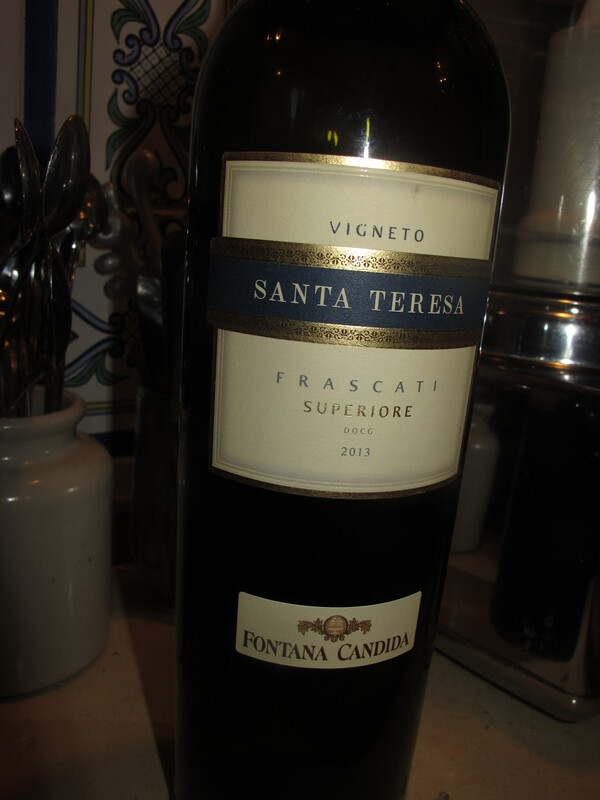 Open a bottle of Frascati DOCG … I chose Fontana Candida’s Santa Teresa. Pour the entire bottle into the pan. 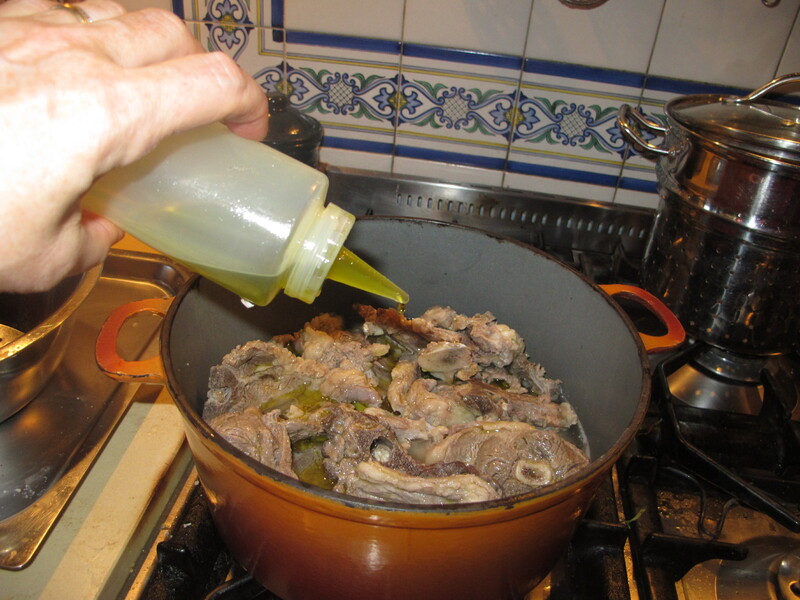 Drizzle a little evoo … not too much, just a little to coat it. 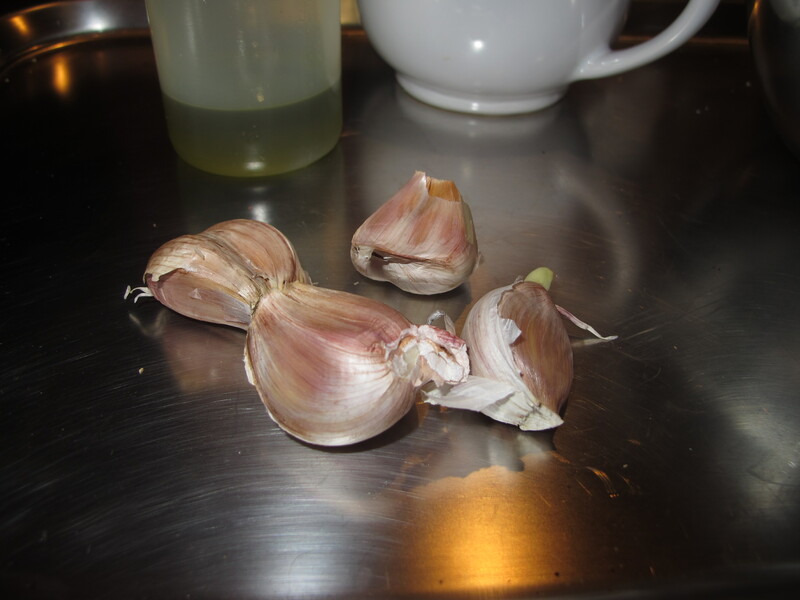 Add 4 cloves of garlic, whole. 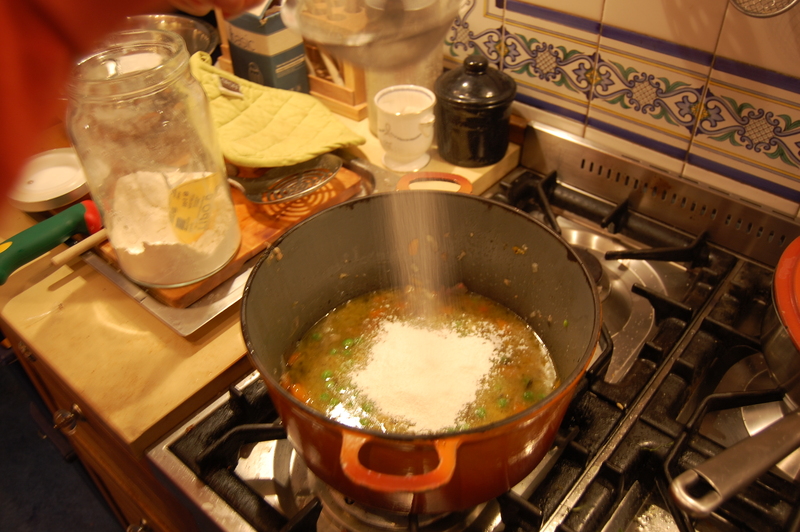 Cover with a lid and start simmering, over a low heat. 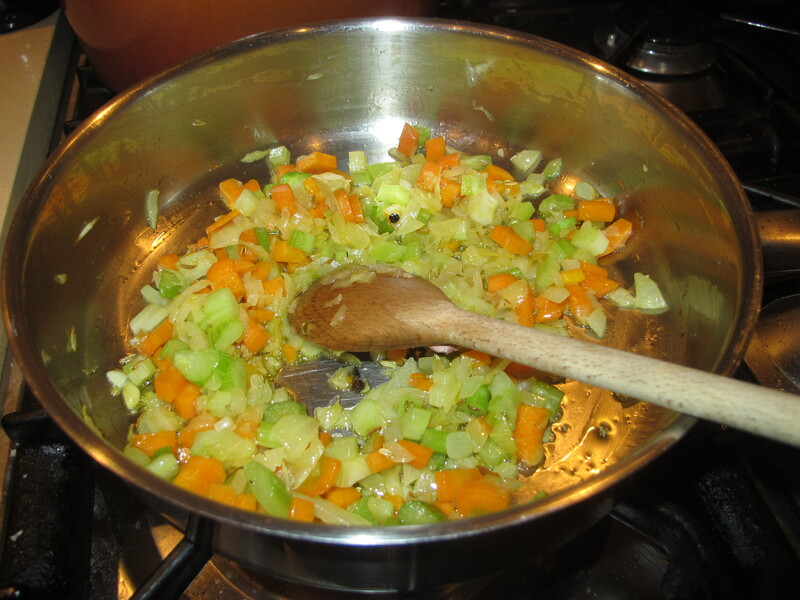 Fennel seeds … Cut up some celery, carrot and onion … the classic Italian soffritto vegetables … and gently stew them in some evoo with a teaspoon of fennel seeds and a few cloves of black pepper. 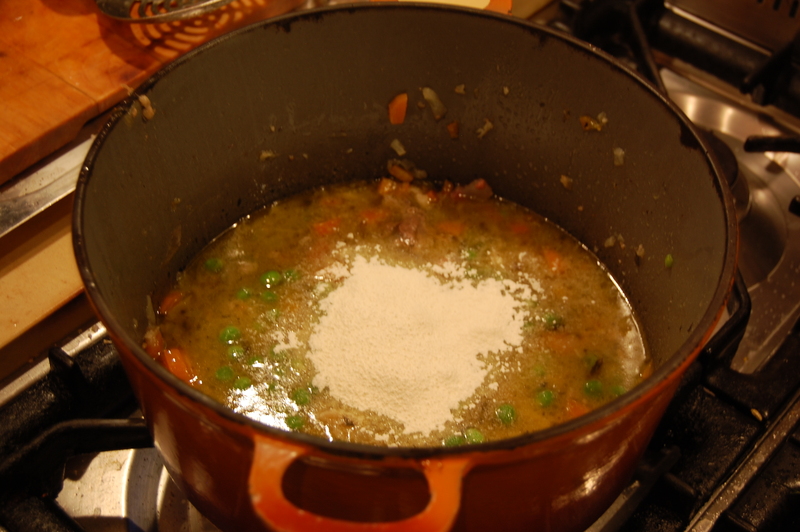 After about 12 to 15 minutes and after having sprinkled some salt over the soffritto … Add it to the meat and cover again. 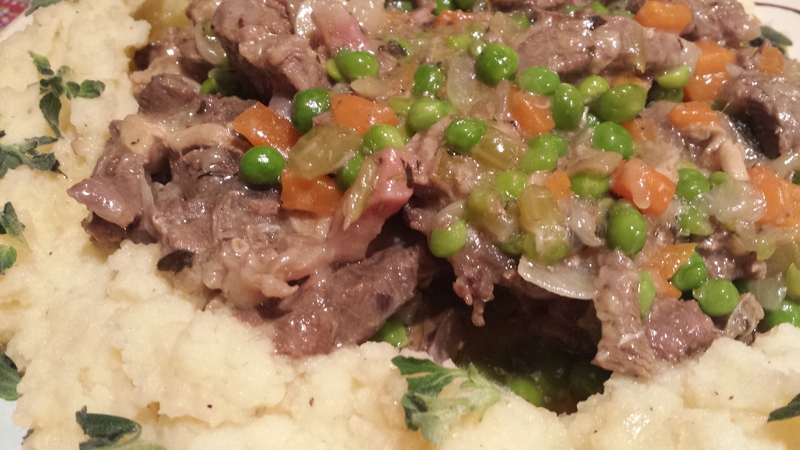 Carry on stewing. 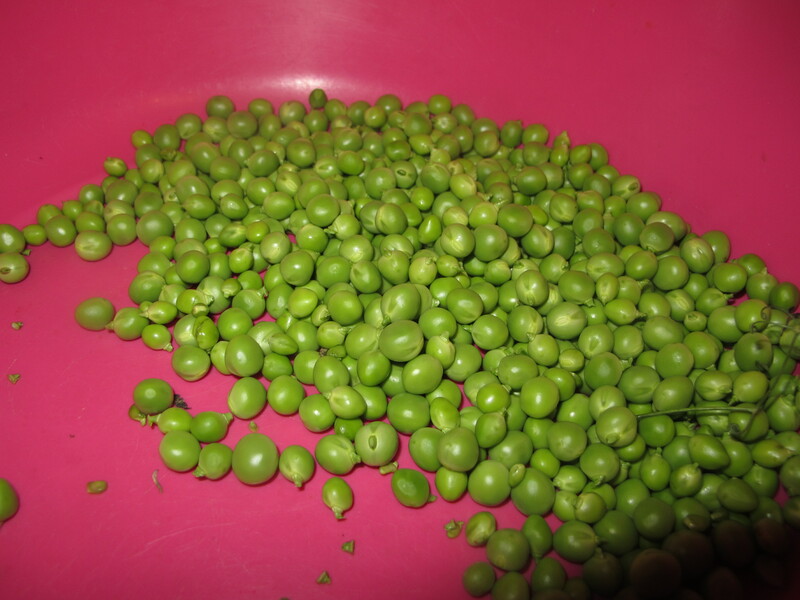 PART III – Cooking the Peas It was my saintly son who went to the trouble of shelling the peas. It is something that can be done the day before, while watching something engrossing on television. 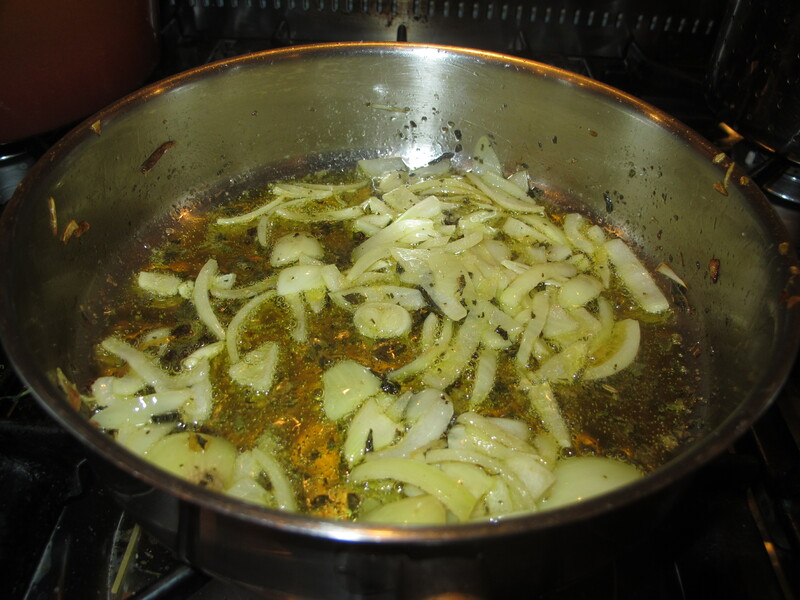 Roughly chop up one onion and cook it gently in some evoo with the addition of dry mint. Repeat : dry mint. This will add a depth to the stew that I can’t describe but one that works beautifully, trust me. 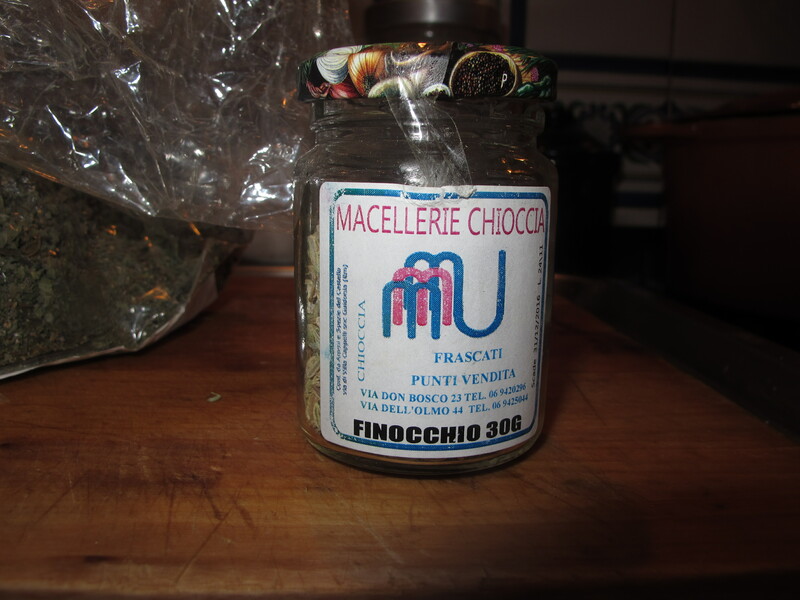 Granted the mint I obtained was the kind the Romans call ‘mentuccia’ (and a search on the internet identifies is botanically as Mentha pulegium), it’s the one that makes trippa alla romana or carciofi alla romana so delicious. I got my dry mentuccia from Maria Regina Bortolato’s line of organically grown herbs ‘Erba Regina’ (I can’t wait for the inaguration of her Castelli farm hotel in early May — http://www.youtube.com/watch?v=QcTTMf82zzY). 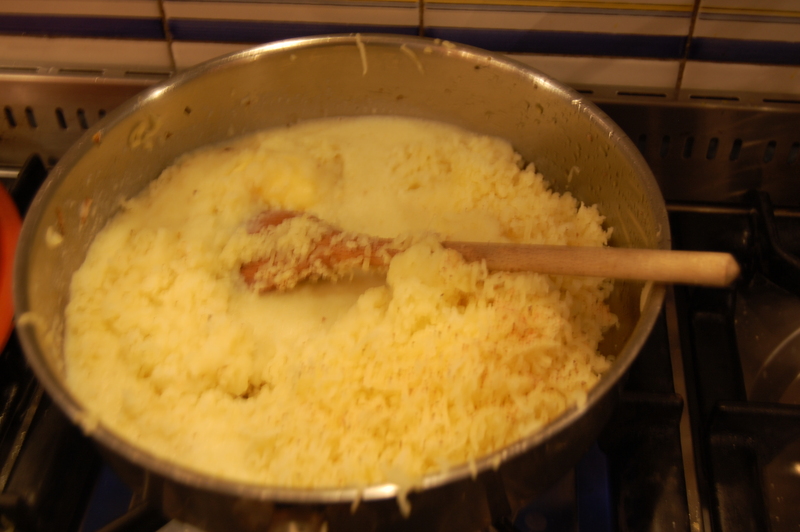 As you can see, I tried to make my ingredients as much Lazio and Castelli-sourced as possible. And yes, the evoo too … it is Quattrociocchi’s and hails from the area near Alatri, in Lazio’s Ciociaria land. 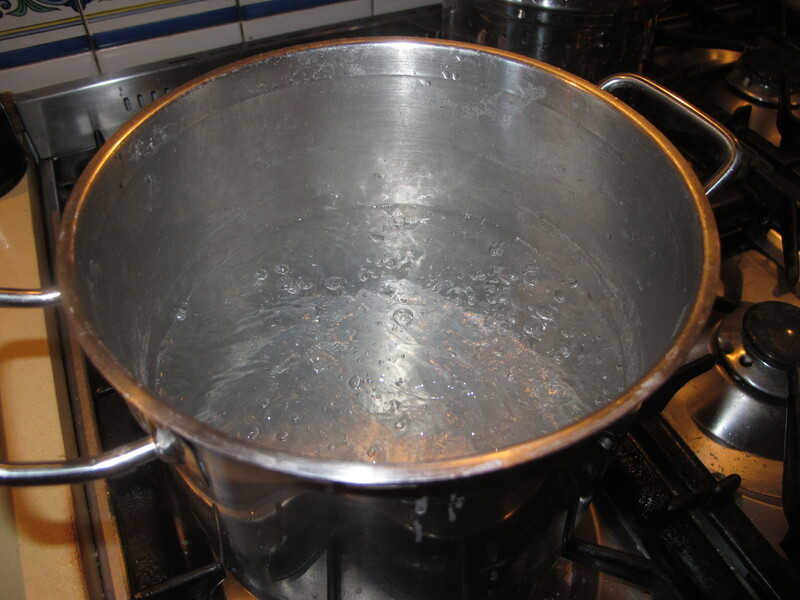 Anyway, on with the recipe. 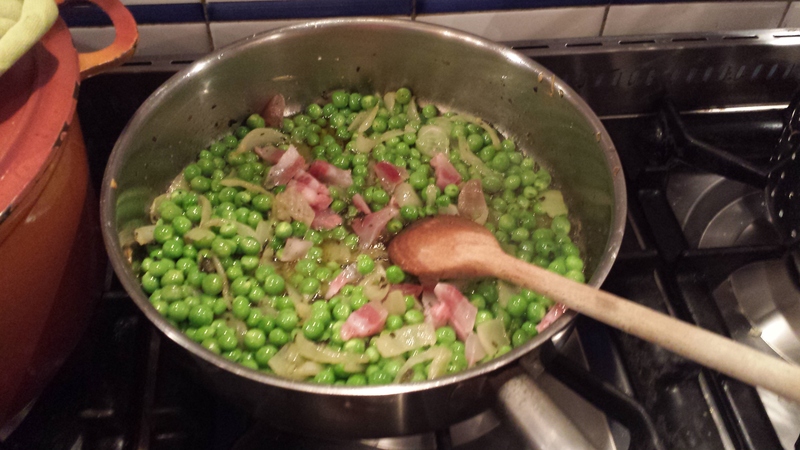 Add one teaspoon of sugar to the peas, as well as a good pinch of salt. Then add a few strands of either guanciale or pancetta. I prefer the guanciale, myself, but either will do. 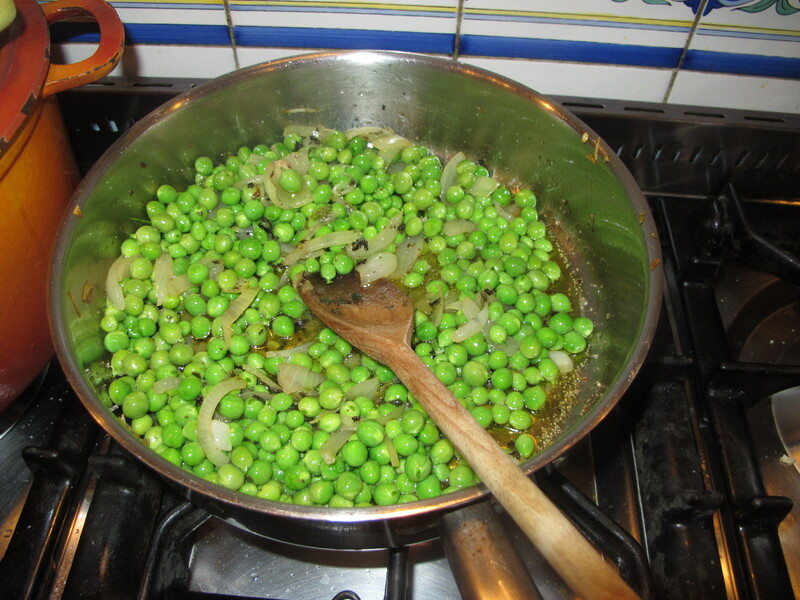 Add two ladles of water and cover the peas and cook until they are tender (this took a lot longer than I thought, half an hour). Set aside. 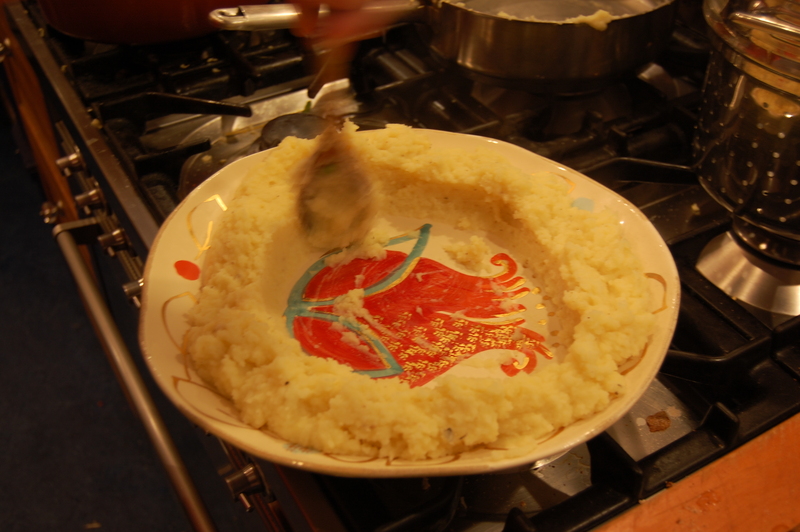 Mash potatoe Italian style includes a few spoons of freshly grated parmesan and a twist of nutmeg. Set aside. 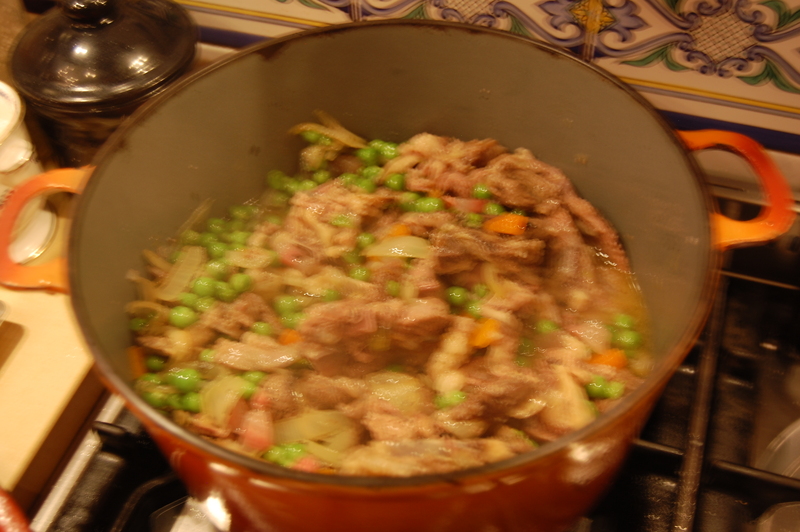 When the stew is almost cooked (and this can take up to 1 and 1/2 hours, it will depend on the meat), add the peas, gently stir, taste and see whether the stew requires a little more salt, and cook for another 10 minutes over a very low heat, without the lid. 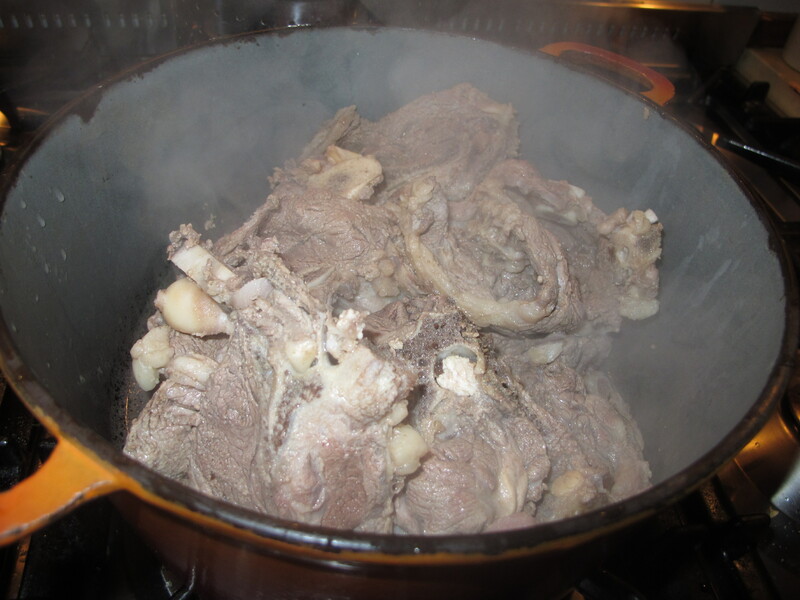 I say without the lid because you can keep an eye on what’s going on better this way … it would be a disaster if the meat got too dry at this stage, Saint Lawrence forbid ! (Saint Lawrence is the patron saint of cooks). 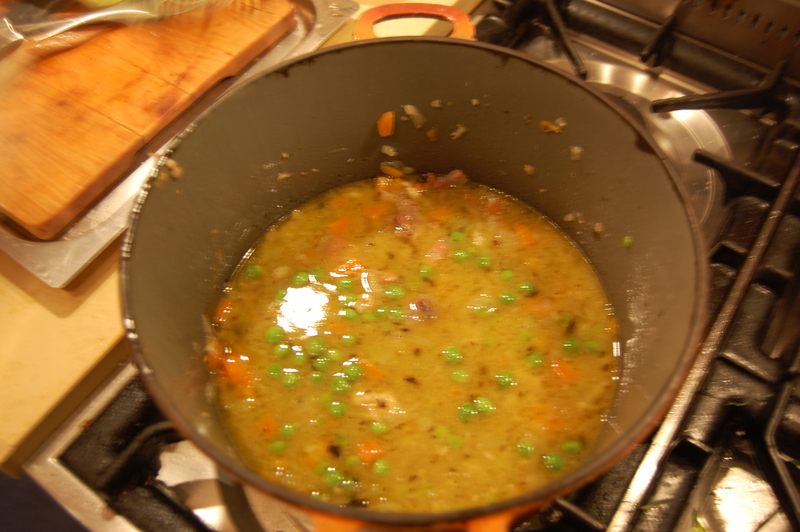 I transferred the stew to the pan where I had cooked the peas. And this was the gravy and juices left behind in the casserole dish. I used a sieve to add some flour … it looks like an awful lot in this photo, but I seem to remember using about 1 large serving-spoon’s worth of flour only. 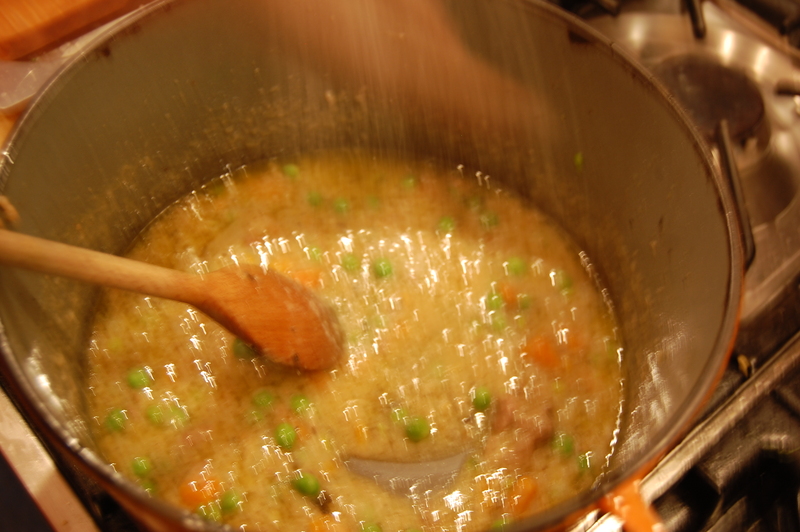 Turn the heat on and use a wooden spoon to mix the flour in and make the gravy thicken smoothly. Cook the flour for at least five minutes (otherwise the flour will ruin the taste). This is an abominable photo … but it was a question of getting the dish right or the photo right, you do understand don’t you. 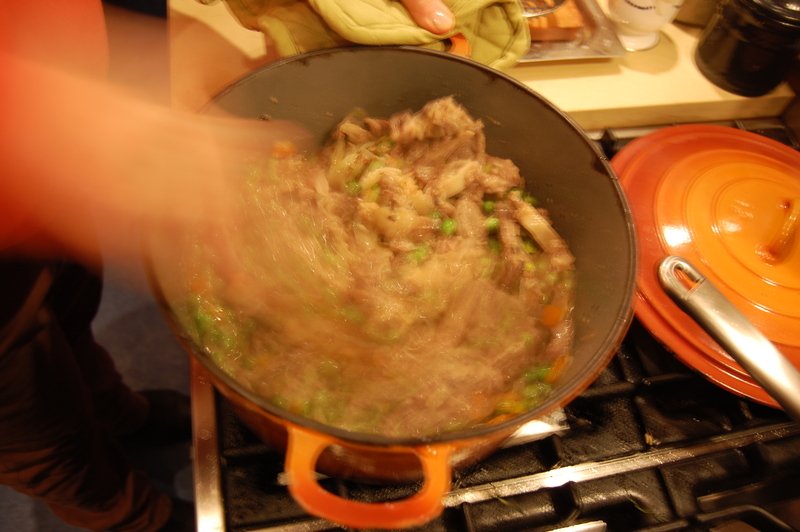 And it was at this point that I added a shot of Brandy, to impart another layer of taste to the stew. 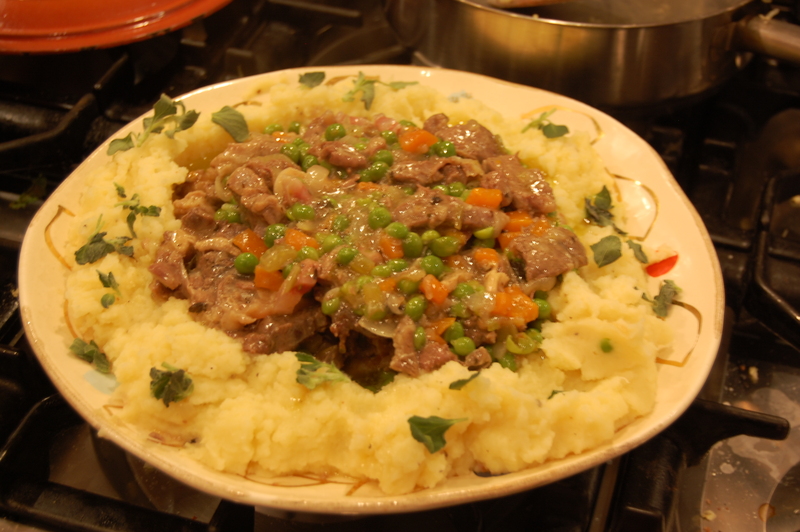 The recipe I have for coq-au-vin adds Cognac towards the end, so I thought I would do something similar and added some Italian Brandy (Vecchia Romagna – Etichetta Nera). 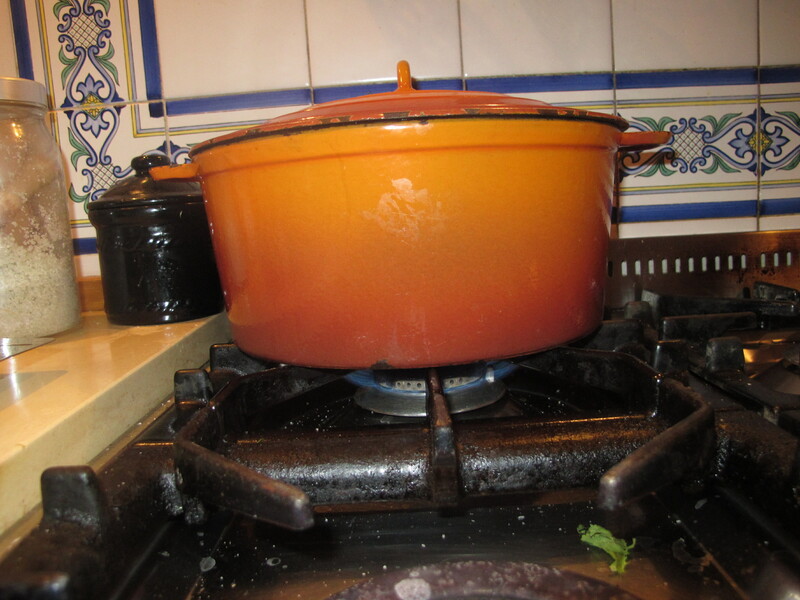 And now the stew went back into the casserole dish and all the ingredients reunited at last. 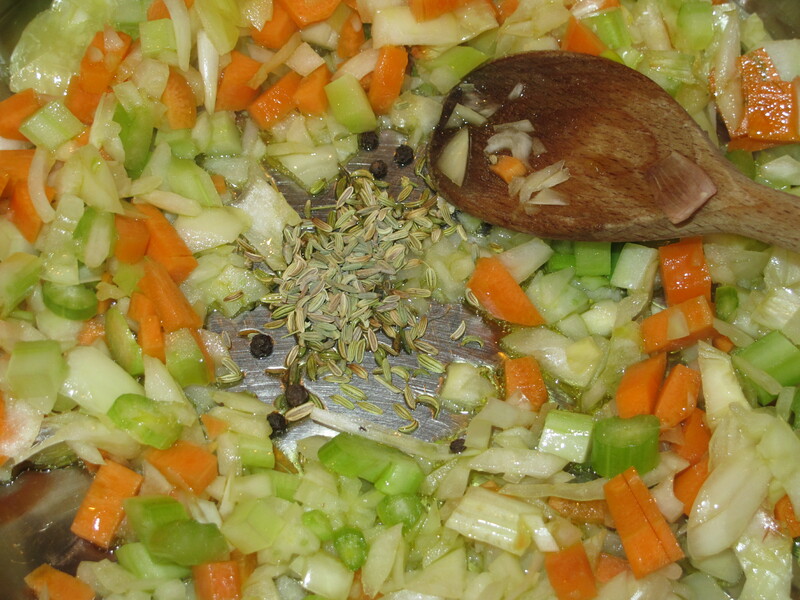 Use a wooden spoon to gently jostle the ingredients into a harmonious whole. A final taste … a twist of pepper, another pinch of salt maybe ? Cover with the lid and get ready to plate. I know it is trendy and aesthetically pleasing, not to mention gastronomically inviting, to plate individual dishes, and I would expect no less at any restaurant. 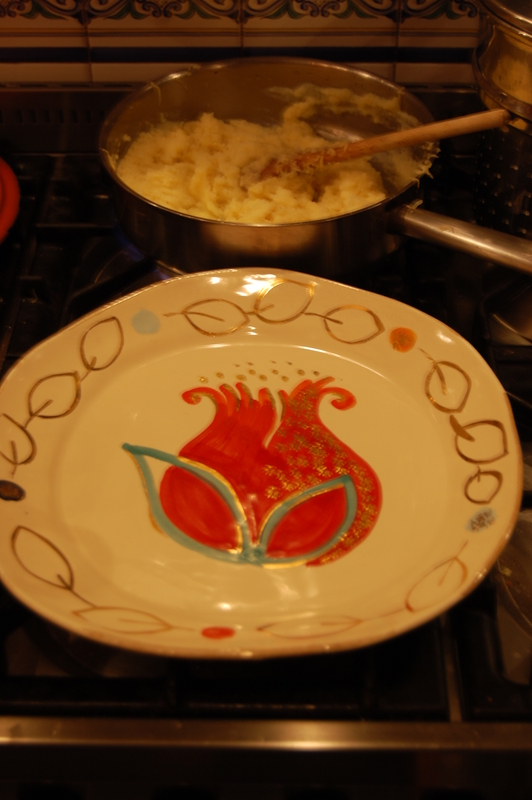 At home, however, nothing speaks more loudly of home cooking and love of friends and family as does a generous serving dish, however 1970s and ‘naff’ that might seem to people who scrutinise such practice disdainfully. Home isn’t about being trendy, though home can indeed be elegant. 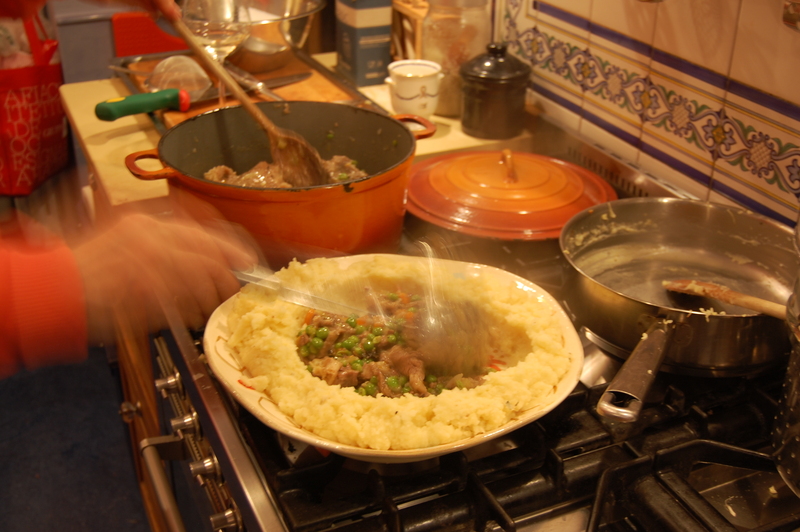 This entry was posted in Basic Techniques, Herbs and plants, italian home food, Secondi (main course, usually meat based) and tagged cassandra Wainhouse, dry mint 'mentuccia', fennel seeds, flour, Frascati DOCG Fontana Candida, fresh peas, garlic, guanciale, Italian Brandy, Maria Regina Bortolato 'Erba Regina', mash potato, Mercato Contadino dei Castelli, mutton, nutmeg, onion, Quattrociocchi Evoo, soffritto, sugar, www.ilvecchiovile.it. Bookmark the permalink. Just signed up, and with great pleasure! I love this detailed post! Looks so delicious and presentation is great! Aw thank you Agnes ! As you can see, it is quite easy to make.